Ekebergparken can offer installations by international artists, as well as museums, restaurants and a panoramic view of the city. 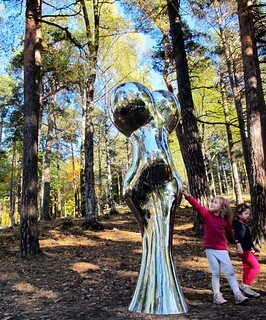 Scattered across 65 acres on a small mountain across the Oslo Fjord from the city, the Sculpture Park includes works by artists that range from Renoir, Botero and Salvador Dalí to Louise Bourgeois, Jenny Holzer and Dan Graham. There are a handful of site-specific works already installed, including a Sky Space by James Turrell, his northernmost to date, which the American artist built into a hillside beneath a newly artificial lake. The hilly area is about the same size as Oslo’s other famous park, Vigelandsparken (The Vigeland Sculpture Park), and is inspired by similar international facilities, such as Louisiana outside Copenhagen, Kröller-Müller Museum in the Netherlands, and Storm King Sculpture Park outside New York. For those for whose impressions of Norway are limited to gravlax, skiing and Edvard Munch, Oslo’s vibrant contemporary art scene, which has been garnering international buzz lately, may still come as some surprise. 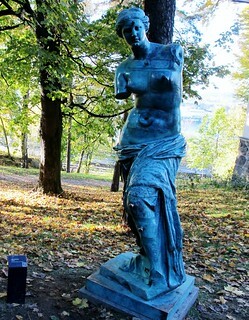 The latest chapter in the Norwegian capital’s development is this ambitious new Sculpture Park – the passion project of Christian Ringnes, a local real estate tycoon who bought the adjacent Ekeberg Restaurant and donated tens of millions to create a sculpture park. In 2005 he refurbished and reopened Ekeberg-restauranten (the Ekeberg Restaurant), the area’s prime eatery. 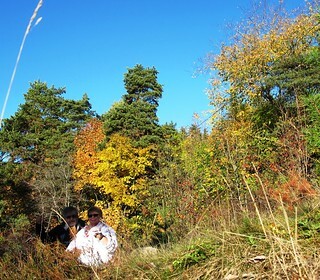 – just 10 min from the centre of Oslo – I would say Recreational! 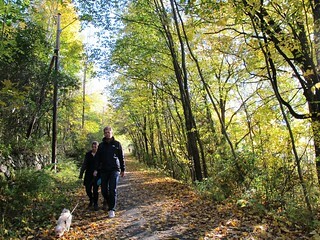 The natural beauty of the park is still part of the attraction and young and old were out enjoying the fall colours. Some of the statues are playfully hidden on the side trails so you have to go looking like a treasure hunt. There is also a nice dog park where both dogs and their people enjoy socialising in the sunny weather. Above you see an unusual sculpture by Dan Graham, and as you can see the viewer becomes a part of the art itself. I hope you enjoyed the trip as much as we did and if you ever get to Oslo don’t miss this experience – just ten minutes by bus or tram from Oslo center. Oslo is the economic and governmental centre of Norway and a hub of Norwegian trade, banking, industry and shipping. It is an important centre for maritime industries and maritime trade in Europe. The city is home to many companies within the maritime sector, some of which are amongst the world’s largest shipping companies, ship-brokers and maritime insurance brokers. 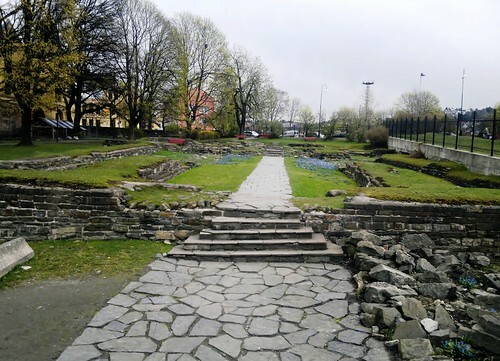 Oslo is also a pilot city of the Council of Europe and the European Commission inter-cultural cities programme. Oslo New Opera House: The construction – designed by the acknowledged Norwegian architectural firm Snøhetta (If you want to have a look at some of their famous project around the world, click here) – is the largest single cultural-political initiative in contemporary Norway. It took five years to build and the result is an extraordinary building that rises directly from beneath the fjord. Founded by the government, the idea was to bring opera and ballet to the people and it’s the only opera house where you can walk on the roof! It’s only 5 min. walk from Grand Hotel so don’t miss it! 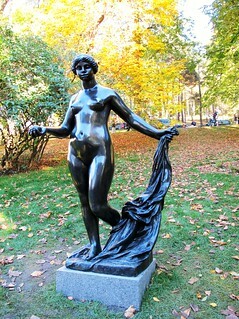 Vigeland Sculpture Park: The Vigeland Sculpture Park is the most striking part of Oslo’s Frogner Park. Gustav Vigeland’s (1869-1943), 212 sculptures attracts over 1 million visitors a year – even more: Vigeland also designed the layout of the entire park. It’s a popular recreational area with a human message presented through the many sculptures depicting the life cycle, and is a must see when you visit Oslo. The Kon-Tiki Museum showing the legendary expeditions of Thor Heyerdahl; the Norwegian Museum of Cultural History; the Viking Ship Museum; the Norwegian Maritime Museum and the ship Fram, used by Roald Amundsen on his polar expeditions. Bygdøy is one of Norway’s oldest cultural landscapes with a rich history. Holmenkollen Ski Jump: Just 20 min. by the tube, you are into the forest and up in the mountains with a breath taking view in the most recreational aria of Oslo. The Holmenkollen Ski Jump is a famous Oslo attraction you should not miss. It’s the home of our national ski museum and was e.g. site of the 2011 Nordic Worlds Ski Championship. 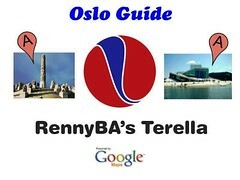 Click the blue marks to find more info about some of Oslo’s attractions – or click text: “RennyBA’s Terella Oslo Guide” (down left) to explore the map in details! Take the Gardemoen Express Train from the airport (fastest = 22 min. and cheepest!). All trains stop at the Central Train Station, every other stops at the station “Nationalteateret” which is right in the centre of the ciry. Then there is a comprehensive public transport system in Oslo, consisting of buses, trams, trains, boats and T-bane/Sub/Metro. Easiest way to explore Oslo and surroundings, the Oslo Pass, provides free travel on all public transport and free admission to museums and sights. Thanks to the Gulf Stream bringing temperate water from the Gulf of Mexico, Oslo’s climate is milder that what its latitude would imply. You’ll get the best weather forecast by clicking here! A visa is not required for nationals of countries with which Norway has signed a visa waiver agreement. Nationals of countries with a visa waiver may stay in Norway for up to 90 days. The countries with which Norway has a visa waiver agreement are listed here. Oslo’s History is peppered with Royal characters beginning in 1048 when King Harald Hardråde founded Oslo and settled in the area. 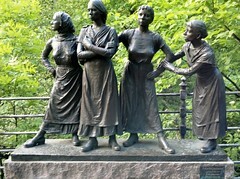 Thus, you can expect a lot of tourist attractions that are in one way or another related to Oslo’s Royalty. The location of Norway’s capital city at Oslo Fjord is a tourist attraction in itself. The city however offers a diverse mix of cultural and modern tourist attractions like the Viking Ship Museum, the Holocaust Center and the Nobel Peace Center. As a blogger for almost 7 years, writing about Norway; our culture, traditions and habits – including attractions in Oslo – I have posted from a lot of these sights. To give you some ideas from my own experience, I have collected some in the map below. Click the blue point to read more! Oslo’s architecture is a sight to behold. The old manor houses provide a glimpse of Oslo’s colorful heritage. If this is your cup of tea then go visit Bogstad Manor (the furnishings of which goes back as far as 1750) and the Tøyen Manor House (given as a peerage estate to Chancellor Jens Bjelke in 1640). Oslo’s Bygdøy island museums present; The Kon-Tiki Museum showing the legendary expeditions of Thor Heyerdahl; the Norwegian Museum of Cultural History; the Viking Ship Museum; the Norwegian Maritime Museum and the ship Fram, used by Roald Amundsen on his polar expeditions. Bygdøy is one of Norway’s oldest cultural landscapes with a rich history. The Holmenkollen Ski Jump is also a famous Oslo attraction that tourists should not miss. It’s the home of our national ski museum and site of the 2011 Nordic Worlds Ski Championship. Have a jolly good time exploring Oslo and I would love to get feedback and reports from your experience. If you’re planning a trip to Oslo, give me a hint in the comments and I will gladly guide you around. We are now leaving for a trip to Tuscany with the entire family, 13 people – 3 generations – yes including my granddaughter – and we are so excited. So stay tuned for some Italian posts later on! Akerselva is a beautiful river with 23 waterfalls running through Oslo’s most populated areas, ending in the Oslo Fjord after 8 km with a rich history of Norway’s cultural heritage and industrialization which started around 1850. The river is the “vein of the city” offering fishing, swimming, biking or walking to explore a rich animal and plant life in the most recreational part of the capital of Norway. It’s running from the lake Maridalsvannet, which is Oslo’s main supply of drinking water, to the city center and without a break: a couple of hours walk. Almost every meter of the 8km from the mountains to the fjords offers exciting adventures. Along the river you can take small detours into side streets you’ve never seen before and experience the history of the utmost importance to the capital and country: it was on the banks of Akerselva that Norway became a modern country and where the industrial revolution took place- It was here that Norway got its first factories and industrial workers! From 1850 to 1900 the population of Christiania increased from 30,000 to 130,000 – the same period as when about half of the populations out of totality 1,500,000 emigrated to the US. For the most part farmhands came from the countryside and moved into settlements along the Akerselva banks to live near the factories they were working in. These houses were often some distance from the river and of very poor quality. Living conditions were crowded and up to 13-14 people could live in a single cramped room with an even smaller kitchen. Today there is a new wave of migrants to the river, but it’s a totally different standard in the new houses. The picture to the left shows an example of a new residential complex on the left and an old factory on the right. Myhre’s factory became one of the leading and largest industrial companies in Norway with more than 1,000 employees in 1909 and also important for the rest of the industry along the river. Production started in this area in 1854 and their main production focused on industrial machinery – turbines and steam engines – and tools for rolling mills and sawmills, utilizing the river as source for power in the production. The company was acquired by Kværner Brug (now a part of Aker Solution) in 1928 and the production naturally developed into supplying the pulp and paper industry. At one point, 85% of their production was exported. This continuous green corridor with water, grass, plants and trees that connect Oslomarka and the Oslo Fjord is also a paradise for animals. It is observed 100 different bird species at the river. Among them is our national bird: the Dipper, which people actually see quite often sitting on the pebbles in the middle of the falls. Even the Goldcrest, which is Norway’s smallest bird, is observed here. Akerselva can even offer four types of bats to be seen flying between trees when dark. 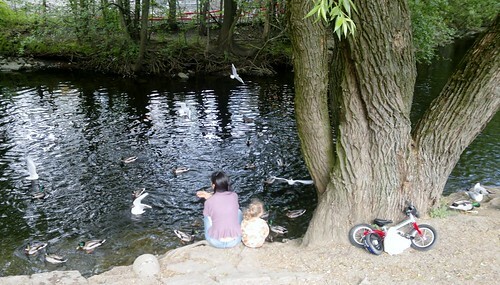 As you can see in the photo however, the most common wildlife is seagulls and ducks. The rivers highest waterfall is next to an idyllic little house which is a great place to stop on your walk along the river Akerselva. The name “Hønse-Lovisas hus” comes from a literary character. It was built in 1800 as a saw miller’s house. Today it is a café and cultural meeting place, where the arts and crafts of today meet tradition and history of the past. They have handmade arts and crafts for sale and you can also get a cup of coffee and a delicious piece of cake or a little something for lunch. 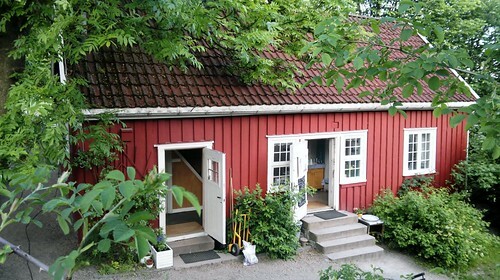 A walk along the Akerselva, especially with such an excellent guide, is a good example of how you can combine an outdoor nature experience with learning about the local history. The area is easy to reach by public transportation, either Underground or Bus, and lies right in the heart of the compact city of Oslo. So don’t miss this trip the next time you visit the capital of Norway. It was founded in 1239, when King Håkon gave the Dominicans a site just north of St. Halvard’s Church. 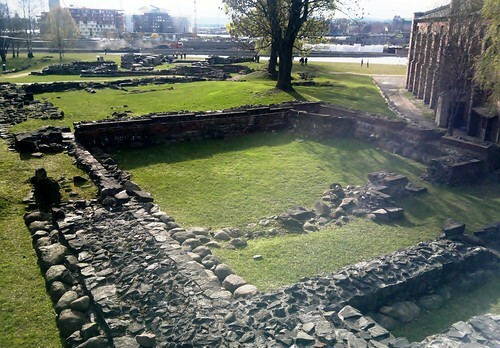 It was already St. Olav’s Church, which had been built a few decades earlier. This would become the Abbey in the new facility, and it was rebuilt to fit the Dominicans specifications. The buildings were probably first constructed in wood and were eventually replaced by brick buildings. The Dominican Order had strict requirements for the design: ground floor and the interior were always the same in all the order’s monasteries as well as the abbey which was represented at the north wing of the facility. The problem was that there was room on the south side of St. Olav’s Church just a few feet over to St. Halvard’s Church, the city’s cathedral. The monastery had to be built north of the church and the Abby had to be in the south wing so in this way, the normal Dominicans concept was reversed here in Oslo. Also know as Oslo Cathedral Church was the city’s earliest cathedral. It was built during the 1100s at the height of the Old Town market square and was used as a church until about 1655. Besides being the bishop’s seat and religious center of eastern Norway for about 500 years, the cathedral was the coronation church, royal wedding church, chapel royal, and one of Scandinavia’s most visited places for pilgrims. Hallvard cemetery is located mainly south of the cathedral. 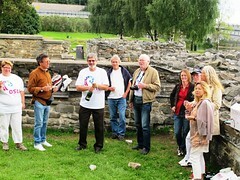 It was the honorary cemetery in Oslo and eastern Norway from around 1130 to 1639. Here the bishops, chiefs and other prominent men and women were buried. The most prominent were interred in the church along with the kings. This was one of the parish churches of old Oslo and lay south of the Bishop’s Palace and Halvard’s Church. It was a stone church with a tower and it was one of the very few churches we know with the double-nave floor plan. Along the middle axis of the choir there were three powerful roof supporting pillars. The church went out of use after the Reformation and was probably in ruins shortly after. It was uncovered in the excavation by Gerhard Fischer in 1921 and remained that way for years. In 1970-71 the archaeologist Ole Egil Eide was given the opportunity to dig further into the ground under the church, and found traces of burials older than the stone church, 81 in all. His interpretation is that there have been at least two churches, presumably stave churches, on the spot where the stone church was built around 1100. 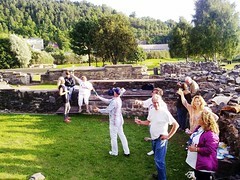 The oldest of the tombs are radiological dated to 980-1030, and are some of the oldest Christian burials found in Norway. The main ruins were the Kings Residence from about the year 1000 to the 1300s and then the Canon’s residence up until the reformation in the 1500s. The oldest finds on this site are part of a simple, circular fort consisting of a moat and one or more wooden buildings. There was a treasure found consisting of German and English coins which place the construction of this fort to somewhere between 1040 and 1060, during the rule of Harald Hardråde (Harald the hard ruler). Construction of the stone fort whose ruins you see in the photo at the bottom of this post, began in the 1200s during the rule of Haakon Haakonsson (Haakon the IV). The main entrance was in the north-west corner and featured a gate tower. 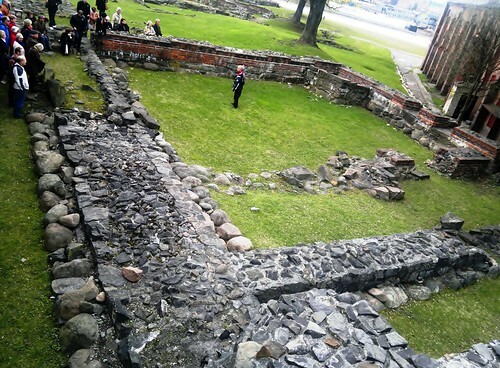 The great hall in the south-east corner was almost as large as The Haakon’s Hall in Bergen. 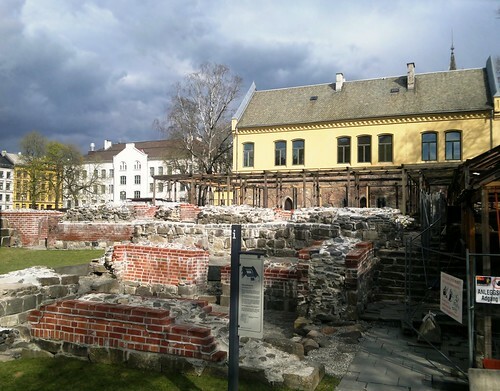 The Kings residence was a citadel, dwelling and meeting place for the king and his men when they were in Oslo. Akershus fortress took over this function already in the 1300s and gradually became the administrative center for this part of Norway. Large parts of the ruins from the Kings residence were removed in 1890 when the locomotive workshop was built on the site.